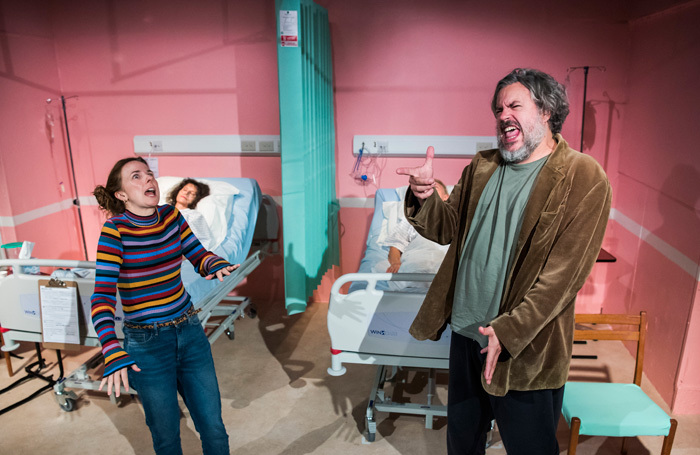 The Finborough Theatre is a lovely space for this show, and the set is as detailed as it is clinical and fully transports the audience to the hospital. Cariad Lloyd leads this show as aspiring comedian Karla, a young woman who although never being particularly close with her mother (played by the hilarious Kristin Milward) spends most of her days sitting in the hospital by her mother’s side, trying out her new comedy ‘bits’ and trying to show up for her mum as a good daughter. But things get difficult once the uptight Don (Rob Crouch) comes in to visit his own mother (Cara Chase), and the two have an intense argument that ends up blooming into a tender friendship that both need more than they realise. The performances are subtle and generous, completely natural and open and the writing by Halley Feiffer really shines through. It is a rare gift to be able make an audience laugh and cry simultaneously, and Feiffer manages this effortlessly. Never an easy topic to write about, this show gives a glimpse into what it is like to see someone you love struggling with this harrowing disease. It’s gritty and real and really gives a representation that is both honest and strange. This show really is a little gem and one that has you engrossed throughout, making the 90-minute running time seem more like ten. A Funny thing happened On the Way to the Gynaecologic Oncology Unit At Memorial Sloan Kettering Cancer Of New York City runs through 27 October. Lovely review, hope you like mine as well!